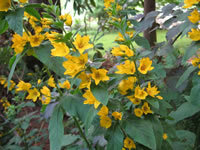 Golden Loosestrife is an excellent plant for bog gardens or next to ponds and streams. This 3-4 foot tall perennial has light green, 3" leaves with serrated edges. In early to mid-summer, they produce abundant spikes of star shaped, golden yellow flowers, tinged in red at the base. Bugleweed is one of the best known and most useful ground covers because of its suitability for many different situations. The flowers may be purple, rose or white. 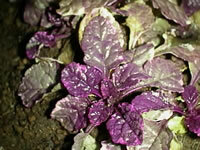 The foliage color ranges from green to bronze to purple or variegated. 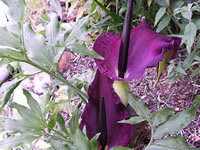 Dracunculus vulgaris is known by many names, Dragon Lily, Voodoo Lily, Viagra Lily and the 'tell it like it is' name of Stink Lily. Luckily the odor dissipates after the first day, allowing you to enjoy the exotic beauty of this unusual plant!